Mums up a Mountain conquer Mount Snowdon raising over an incredible £2,400 to support seriously ill children and their families. 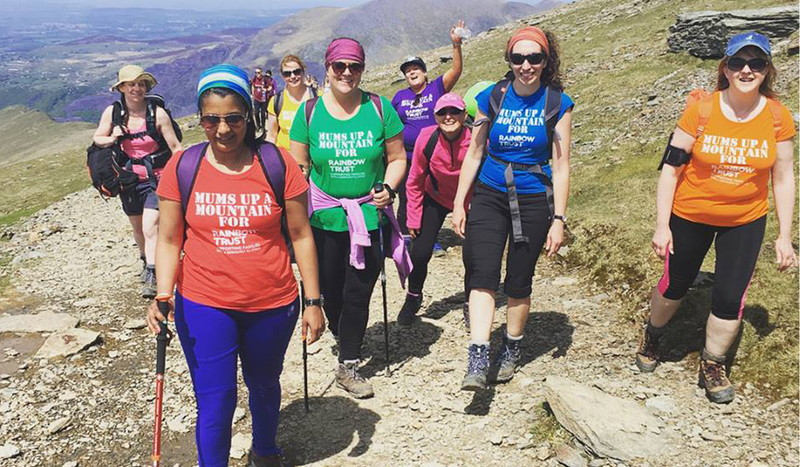 The ‘Mums up a Mountain’ team consisting of 8 friends, Ruth, Viv, Kerry, Supreeta, Catherine, Deanne, Anna and Jane, took on the incredible challenge of climbing 3199ft up Mount Snowdon in North Wales. The group were inspired to fundraise for Rainbow Trust as they know firsthand how vital our support can be. Their friend Karena and her family are currently supported by Rainbow Trust as her son has been diagnosed with a brain tumour and is undergoing chemotherapy. Rainbow Trust also provides support to his two brothers, helping them keep some normality while their brother undergoes treatment. The team created a colourful display on the mountain, walking in their bright t-shirts with an array of coloured balloons attached to their rucksacks! Having set themselves an original target of £1,000, the group of determined mums went on to raise an incredible £2,480. This money will enable us to provide 108 hours of practical and emotional support to a family caring for a terminally ill child, helping them make the most of precious time. If you’re thinking of taking on a climb, or perhaps you want to tackle all Three Peaks yourself, then contact events@rainbowtrust.org.uk for more information.